I recently stumbled on a comment by Amory Lovins under an article by Fred Pearce at Yale 360 called Industry Meltdown: Is the Era of Nuclear Power Coming to an End? 360 holds every comment for moderation, which tends to thwart any meaningful dialog but that's a little better than no comment field at all (VOX), and much better than CleanTechnica's method of systematically censoring comments and commenters who have viewpoints that differ from that of the moderator. Watch for his confirmation bias and the backfire effect--a term that describes how people will cling ever more, ah, heartily, to a strongly held belief when confronted with facts that dispel it. There is very little difference in that respect between creationists and anti-nuclearists like Lovins. In the first five years after Fukushima, Japan has displaced 70% (64% without GDP renormalization) of its previous national nuclear output with electricity savings, renewables, and a bit of other distributed generation. Your link is broken and your source which states that its mission is to “establish a society based on renewable energy,” is suspect. 55% OF $ 56.33 billion = $30.98 billion. 5 years x $31 billion/year = $155 billion dollars lost to fossil fuel costs as a result of antinuclear fear mongering that has closed Japan's nuclear. How many nuclear power stations would that have paid for in that brief period? (Note that my original comment had misinterpreted the $169 billion as being for each year instead of the cumulative total). Coal use was 10 percent higher in 2015 than in 2009 (source: BP statistical review). Data in German? Wholesale prices drop when wind or solar create a glut on the market (because it has little value). Exporting that glut to areas without wind or solar is a way to minimize damage to the finances of your own domestic power producers (who have bills to pay). Beware of those who want you to believe that German emissions would not have been less had they closed coal instead of nuclear. 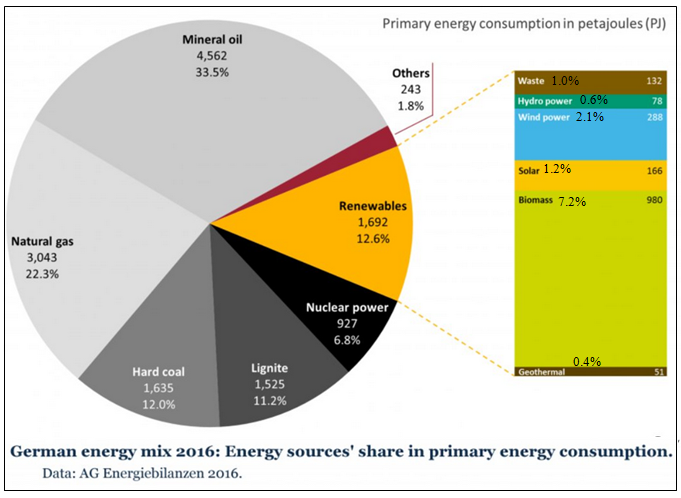 Roughly 40% of German electricity still comes from coal. The French Academy's "common-sense" claims are a throwback to the 1990s, ignoring extensive European analysis and experience in achieving high renewable electricity shares (e.g. in 2014, as a fraction of total annual domestic consumption, 46% in Spain, 50% in Scotland, 59% in Denmark, 64% in Portugal) without adding backup capacity or bulk storage, and with superior reliability. When wind oversupply would crush their energy market, they export it to other grids that have little wind. 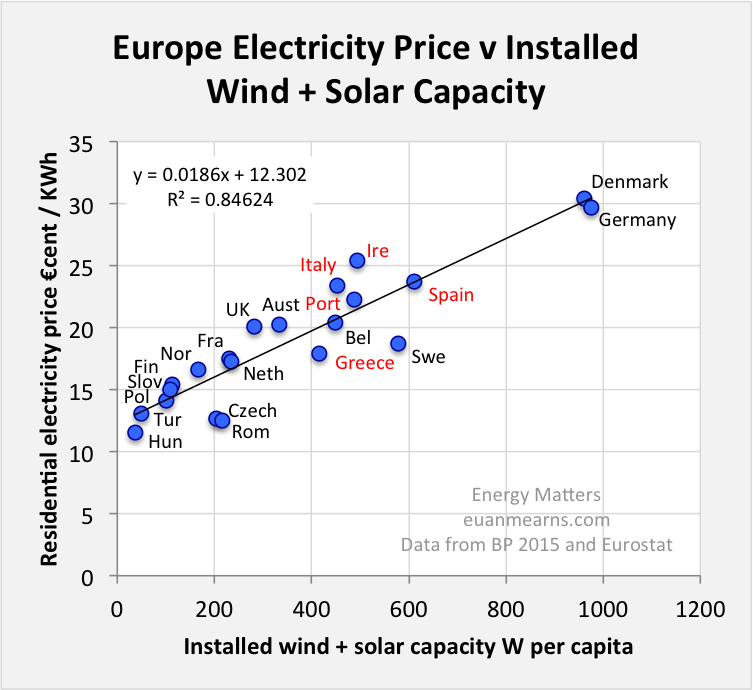 So what happens when those grids have as many wind turbines as Denmark? Denmark won't be able to export it. So, in other words, because Denmark is part of the Nordic Synchronized Area, it isn't really supplying 40% of the energy to that Nordic grid with wind. It's supplying about 10%. Denmark just happens to use most of that wind because the turbines are located in Denmark and closer to the sources that use their electricity. The game's over once the other countries in their grid get as much wind as they have. And that's the point. They will likely stop wind development far short of Denmark because they don't want to be crushed by their own wind causing oversupply. They will use Denmark wind, i.e., Denmark is only supplying about 10% to the grid it is part of. This is also true for the other countries in your list. Indeed, the ultrareliable former East German utility 50Hertz in 2015 got 49% of its electricity from renewables, three-fourths of them variable (PV and windpower), and its CEO says it could readily go to 60–70%, still without adding bulk storage. Indeed …but growth of the non-intermittent renewable sources (biomass and hydro) as well as solar are grinding to a halt in Germany which leaves wind as the only source with much potential for further growth. Note that wind currently supplies only about 2% of Germany’s total primary energy consumption. What I find puzzling is the lack of evidence that high penetrations of sporadic energy sources decrease the electric bills for citizens. Your above comment rests on the assumption that they do. Nuclear advocates' claim that closing a reactor always means burning more fossil fuel is worth examining but is clearly untrue in Japan, Germany, and even Vermont, where the uptick in gas-burning lasted only a year: NE-ISO's 2014–16 nuclear output loss was 91% offset by renewables and hydro-dominated imports, and another 69% by reduced sales. Japan? Nuclear output dropped 158 TWh while the combination of wind, solar, hydro, geothermal, and biomass only increased 42 TWh (data per 2016 BP Statistical Review). 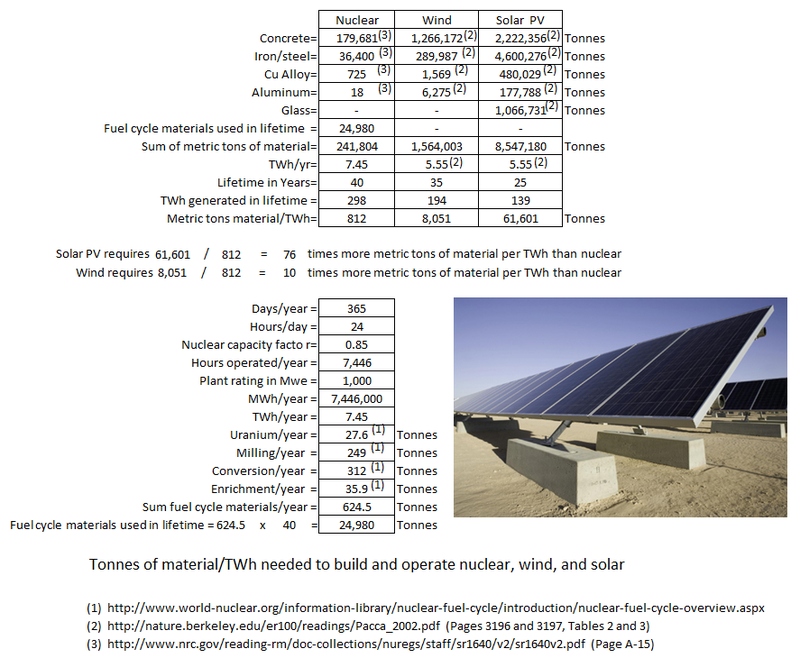 The increase in renewables did not offset the much greater loss of nuclear. And if the rest is from energy conservation, then clearly reductions would have been even greater had nuclear not been shut down. Germany? Like I said earlier, beware of those who want you to believe that German emissions would not have continued to decline had they closed coal instead of nuclear. Roughly 40% of German electricity still comes from coal. Vermont? Your comment about Vermont appears to say that 91% + 69% = 160% of nuclear power was replaced by renewables plus hydro power (which is a renewable) along with reduced sales. But a reduction in emissions from energy efficiency would have existed with or without replacing one zero carbon source (nuclear) with others. Certainly, few nuclear plants can be replaced by hydro and if that is really the case in Vermont, it must have been excess hydro not being used by somebody else already or hydro taken from some other user who has had to replace it with something else, low carbon or not. Grid integration of variable renewables has at least ten flexibility options, not only in supply but also demand (efficiency and flexibility), and not only in bulk electrical storage but also in thermal storage (in buildings' thermal mass, hot water, cold water, ice), hydrogen, and distributed storage worth buying anyway (such as bidirectional smart-charging electric vehicles). Why did you say “variable renewables” when you mean wind and solar? And why have these options not scaled up in the decades you have been promoting them? Why will they suddenly scale up a few orders of magnitude in the next few decades just because wind and solar need them? And if they are feasible, why couldn’t nuclear baseload charge all of these storage devices at night when demand is low to minimize the need to run gas power plants in the day, and why haven’t they already capitalized on all of this theoretical profitability already? You are confusing untested hypothesis with facts. And again you said renewables when you meant wind and solar. …that's the costliest option, so it would be bought last, not first, we needn't wait for it, and the market isn't waiting. We already know that hydro works without need for backup. Don’t know what you mean by “the market isn’t waiting.” Remove wind and solar subsides and growth would come to a standstill, as happened in Germany with reduction of the solar feed in tariff. Shellenberger's claim about land use is wildly off. Your renewable energy footprint paper should be used to teach classes about confirmation bias. Do We Have the Tools to End the Fossil Fuel Age?